We’d love your help. 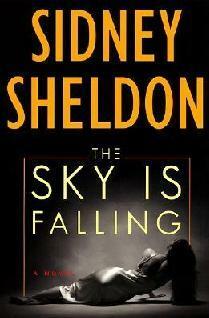 Let us know what’s wrong with this preview of The Sky is Falling by Sidney Sheldon. Washington TV anchorwoman Dana Evans (from Best Laid Plans) suspects the accidents befalling the rich Winthrop family, killing all five members, were murders. Like Chicken Little and the sky falling, she chases clues across the world to unravel an international conspiracy. The inheritance goes to charity, so money is not the motive. Her Sarajevo ward Kemal gets expelled, a Washington TV anchorwoman Dana Evans (from Best Laid Plans) suspects the accidents befalling the rich Winthrop family, killing all five members, were murders. Like Chicken Little and the sky falling, she chases clues across the world to unravel an international conspiracy. The inheritance goes to charity, so money is not the motive. To ask other readers questions about The Sky is Falling, please sign up. character sketch of dana evans? A fantastic read.In a normal book,the suspense is about who the killer is.But in this Sidney's masterpiece,the suspense builds right from the start on whether the consecutive deaths are murders are just a co-incidence.The character Dana Evans is portrayed with a surgeon's precision and I would love to meet such a character in real life.The cute love between Dana and Jeff, Jeff's concern for his ex-wife Rachel while she is in trouble are all simple things that make up this master-piece.The secret A fantastic read.In a normal book,the suspense is about who the killer is.But in this Sidney's masterpiece,the suspense builds right from the start on whether the consecutive deaths are murders are just a co-incidence.The character Dana Evans is portrayed with a surgeon's precision and I would love to meet such a character in real life.The cute love between Dana and Jeff, Jeff's concern for his ex-wife Rachel while she is in trouble are all simple things that make up this master-piece.The secret Plutonium manufacturing city which is claimed to be 'real' by the author gives the readers creeps.Dana is being followed by strangers without her knowledge and that adds to the tension.There is no way one could find the real criminal till Sasha is murdered. I feel the end was a bit rushed through and the climax is far-fetched.However the first parts of the book make up for the quick ending.The five murders and the way Dana goes about her investigation,her actions being monitored by some unknown agents are all typical Sheldon stuff. A must - read novel for everyone.Please don't miss it. For more such reviews, visit my blog. I picked this up at a library sale, having never read anything from Sheldon before, and the dust jacket spoke highly of him and his other work (books, TV shows, awards, etc.). Well, it's obvious they weren't talking about this book. This one contains a very thin plot, foreseeable twists, and very little imagery outside of the basic story. Good authors, who do their homework, can put the reader in the character's shoes - what they're thinking, feeling, and seeing. Here you have a main character w I picked this up at a library sale, having never read anything from Sheldon before, and the dust jacket spoke highly of him and his other work (books, TV shows, awards, etc.). Well, it's obvious they weren't talking about this book. This one contains a very thin plot, foreseeable twists, and very little imagery outside of the basic story. Good authors, who do their homework, can put the reader in the character's shoes - what they're thinking, feeling, and seeing. Here you have a main character who travels to half a dozen major cities around the world and she may as well have been traveling to Des Moines, IA. Sheldon doesn't even mention jet lag after the third or fourth flight in a week. He does, however, feel the need to introduce EVERYONE by full name - I don't care what the hotel desk clerk's first and last name is, and knowing it doesn't make me feel like I'm in Paris. This was Sheldon’s second to last novel published before his death. The usual style is there: strong, determined heroine, a hidden agenda/conspiracy, worldwide travel to exotic cities. But for some reason, even though the pacing was written in Sheldon’s rapid-fire style, it seemed to take a while for things to wrap up. Not his best, but not his worst. Only so-so for me. Quick read. Not necessarily my cup o' tea. I'd just finished a book. I wasn't sure what to start next. I was in the mood for something mystery/thriller. I didn't have anything that fit the bill on my shelves at present and no time to run to the bookstore. Two friends of mine had just finished reading this book, they liked it and recommended it. I said, why not give it a try. We have different tastes in book genres, the three of us but they both said that Sidney Sheldon is one of their favorite a Quick read. Not necessarily my cup o' tea. I'd just finished a book. I wasn't sure what to start next. I was in the mood for something mystery/thriller. I didn't have anything that fit the bill on my shelves at present and no time to run to the bookstore. Two friends of mine had just finished reading this book, they liked it and recommended it. I said, why not give it a try. We have different tastes in book genres, the three of us but they both said that Sidney Sheldon is one of their favorite authors. I'd never read a book by this author until now. Here's what I thought. This will be a semi quick review. The Sky Is Falling is supposed to be about a local news reporter, Dana Evans who's curiosity about a well known philanthropist's murder get's her into more trouble than she bargained for. Prior to this adventure, Dana was a news correspondent in war torn Sarajevo. Now she is back in Washington D.C. doing the local nightly news, she's engaged to the sports caster and she is trying to be mother to a orphan from Sarajovo named Kemal who lost his arm and his family to a bomb explosion. Dana does an interview with philanthropist Paul Winthrop and the next day, he's dead. Something feels not right about this and Dana starts, in the beginning out of curiosity to look into his death. She finds that he was the last of a rich American family who within months of each other have had sudden strange deaths. Everyone talks well of the family as if they were saints but Dana feels in her gut that there is something not right under the surface. She just couldn't accept that they all came face to face with accidents. These were murders and she would get to the bottom of it. To be honest. This was a quick read and I'm glad. To me this is very drug store/grocery store I need something to occupy my time at the airport or while waiting for an appointment type of book. It was too simple. Too inconclusive. Too many loose ends and totally not believable. Too many random one page characters that were very transparent or just too simple. All the supporting characters were feeble to me. Under developed. The descriptions were of what they supposedly looked like physically but nothing supportive in the script to tell me who these people really were. What was their purpose besides their name or title. Fiction is fake and mysteries and thrillers are fantasy or infringement but this was just too B movie for me. Trying not to give away spoilers here but Dana encountered people who spoke different languages and you mean to tell me every time she could speak those languages? She was a local news reporter yet she was known world wide? Really? The relationship between her and the adopted son was just.. so careless. It didn't feel like there was any feeling or genuine connection. If there was supposed to be it was not communicated so the reader comprehended this. At all. The fiance' had some side story that I still don't comprehend the point of. Why was it there? The story was fast moving and slow moving at the same time. Fast from this place to that place to this spot to the other but technically nothing really interesting happened till the end of the book. The end was interesting but still... Hollywood B movie. Recommend? It was quick. It passed the time. That's about it. I don't think I'll read any more of this author's books. Just not really my cup o' tea. Maybe it's the book snob in me and I mean no harm with it but.. I read Literature.. this was a book. One makes you think, ponder, feel and learn. The other causes you to exercise the mobility of your hands turning pages and exercise your retina's reading from one side to the other. But to each his/her own. I'm an advocate of reading in general. Sadly some don't even read at all. Not because they can't but because the TV and Internet have stolen their soul. So if it makes you read, whatever it is, much respect and enjoy in good health. Not finished - Probably won't finish since the e-library copy expired on my nook color a week ago. Sidney is a talented writer, no doubt. I just didn't care for this particular novel. Read "Memo Not finished - Probably won't finish since the e-library copy expired on my nook color a week ago. Sidney is a talented writer, no doubt. I just didn't care for this particular novel. Read "Memories of Midnight" for a great Sidney Sheldon novel. a friend recommended this book to me have to admit I did not expect a lot but I was pleasantly surprised.. THE SKY IS FALLING is a scintillating thriller set against a world-class background. The elegantly crafted plot builds from curiosity to terror culminating in a conspiracy of enormous proportion. While fiction has its roots in truth, from the Author's Note at the end, one wonders. Could this really happen, or has it? Dana Evans was the star for the right reasons. Investigating into Winthrope murders, the biggest mistake she made was taking friends for friends. An obvious enemy is an open option and one expects such things from them but who is worst of all enemies? A friend turned foe. Trusting someone is a hard job, not everyone roots for you but the people who really do, carve a way to do so like Jeff and Kemal. If this was a story of selfish, cold blooded murders, it was also a story ab Amazing Amazing book! If this was a story of selfish, cold blooded murders, it was also a story about compassion and selfless-ness. Thrilling, exciting, fast paced and engaging. The most striking thing that I felt about this novel was its well laid clear story line. Protagonist, Dana Evans, a news reporter and anchor, is obssessed with a series of murders that look very much like accidents but it rings the bells somwhere. The hunt for witnesses is on and Dana goes around various countries to find something about Winthropes. Somewhere I felt that story is mostly focused on Dana and the rest of the people are fill ins; a bit of rounded characters. Everyone is almost stereotypical. The best way to distract someone is to divert them to wrong clues. Truth is an illusion and if the frame of reference is false, one can hardly see through it. I'll not spoil the plot twist BUT it left me shocked... utterly stunned. One day, you find yourself picking up a book you would never think about laying your hands upon and almost suddenly this novel has you fastened to the couch ominously preventing you from gazing away, even for a second from its iron-grip. The protagonist is a witty news reporter that has acquired fame from the perilous, lethal news reports she covers. The genesis of the plot is sparked by the curiosity she succumbs to after the death of the last member of the affluent Winthrop family-all 5 of which have died 'accidental' deaths within the appalling span of a year. The book was thoroughly equipped with treachery, deception and treason but at the same time it also depicted loyalty, love and friendship in its most versatile framework. It differentiated between the qualities that people portrayed and the obverse ones they possessed. It was a breath of fresh air-for me,someone who isn't accustomed to reading crime debut thrillers. The form of speech was was simple, and could be easily comprehended. I loved the fact that this book got me thinking, it got me trying to outsmart the author- miserably failing in unearthing the end. All i can gather from an author such as Sidney Sheldon on a first read is that his book was anything but cliche. It was thoroughly drenched with enigma and suspense and drove me toward the edge of insanity in unfolding its mystery.Toward the end, the murderer turned out to be someone i never quite managed to put a finger upon. In all totality the book was remarkable, the plot- an endless tornado distinctly whirling its way through a myriad of possibilities. I wish the sky fell on me before I even reached for this book. The first book I read by Sheldon I didn’t like, however I decided to give him another chance because a few of my friends liked his work, maybe I just picked up a bad one… so this is my second Sidney Sheldon book and I still don’t like his writing or whatever this is called. I wanted to be stubborn and finish it but the book is so damn annoying and… gaaah! The synopsis made this book sound great, however the exe DNF-ed halfway through. The synopsis made this book sound great, however the execution of the idea is poor. Characters are lifeless and unmemorable; you can’t connect to them. The writing is too simple even less than simple there is no description of… anything, just the writer telling us what happened in as few words as possible. •	The fractured “story”. We jump from one scene to the other and then to the next one… does that scene have any point? Probably not. How was important for Dana’s mother to call her and tell her she thought Dana would cry at the Winthrop funeral, were Dana answers that she did cry. What importance did that scene have?! •	So many POV’s! There is someone following her or whatever? Okay, cool, show me then don’t tell me; especially not in a paragraph containing only a few sentences. •	The dialogue is so… so eh. Well... this book really disappointed me. After quite some time since couple of people recommended Sheldon to me, I decided it was time to try his books. They all said that "The Sky Is Falling" is one of his best books. Considering this statement was right, I am in no way eager to read any other. Although the idea of the story itself is good, its potential was, somehow, wasted. All the time during the reading, I was under the impression that this book was not written, but simply, put together in Well... this book really disappointed me. After quite some time since couple of people recommended Sheldon to me, I decided it was time to try his books. They all said that "The Sky Is Falling" is one of his best books. Considering this statement was right, I am in no way eager to read any other. Although the idea of the story itself is good, its potential was, somehow, wasted. All the time during the reading, I was under the impression that this book was not written, but simply, put together in a rush. The plot is very weak, only made to look complicated, but actually too simple and truly predictable. Dana is visiting some truly astonishing places, but their descriptions do not even exist. Just a couple of words to support the sentence. The number of side characters too big. The conversations are plain, too short, empty, emotionless. Even though it can be understandable for a thriller to be lacking on the "emotional-drama" side, it is still necessary for a story to work. It is also possible to accomplish both high-adrenaline action and emotional approach to the story and characters. (Take Harlan Coben`s novels for example), so it is not an excuse. In this book, you can not connect even with the main character. 18/18 --> I've read them all! If you've read The Best Laid Plans, you would have come across Dana Evans. In this story, she's more fearless than ever - or at least that's what she seems to be. She goes on a manhunt across three continents after having suspicions about the series of deaths that wipe out the remaining members of the Winthrop family in one year. I wasn't very fond of The Best Laid plans to begin with. Sure, I liked Dana then and I liked her on this book but the story itself didn't 18/18 --> I've read them all! I never thought in a Gazillion, Billion years that I would find a Sidney Sheldon book that I couldn't finish. I feel as though I have stepped into the twilight zone. The plot was so fractured that I could barely follow - one moment we were talking to Dana's manager, then her adopted son then someone else... A whole scene in which her mother's new husband insults her adopted son and its over in a paragraph... Usually with Sidney Sheldon's novels we are given so much detail about our narrator that I never thought in a Gazillion, Billion years that I would find a Sidney Sheldon book that I couldn't finish. I feel as though I have stepped into the twilight zone. The plot was so fractured that I could barely follow - one moment we were talking to Dana's manager, then her adopted son then someone else... A whole scene in which her mother's new husband insults her adopted son and its over in a paragraph... Usually with Sidney Sheldon's novels we are given so much detail about our narrator that we feel every one of their feelings and small exchanges such as this become interesting and progress the plot, but I barely knew Dana. Yawn. Another book from the box o' paperbacks (I am beginning to sense why my neighbor is getting rid of them..). Written in the early nineties - characters were pretty lame. Tons of story lines and none of them intriguing enough to develop - apparently even for the author. مممم اول مرة اقرا هالنوع من الرواياات..
Cuốn tiểu thuyết thứ 2 mình đọc của Sidney Sheldon và lần này lại là một cảm giác hào hứng trước cuộc phiêu lưu đầy kịch tính nữa của nhà văn này. Một đặc điểm trong cách tạo hình nhân vật của Sidney rất đặc biệt, đó là ông luôn chọn bắt đầu câu chuyện với những nhân vật nổi tiếng và có chức vụ cao (tất nhiên là hư cấu) đặt trong bối cảnh xã hội thì lại có thực. Điều này tạo cho những nhân vật chính có những đặc quyền mà hầu như ít thấy trong những tác phẩm khác. Hơi khác với "Cát bụi thời gian", Cuốn tiểu thuyết thứ 2 mình đọc của Sidney Sheldon và lần này lại là một cảm giác hào hứng trước cuộc phiêu lưu đầy kịch tính nữa của nhà văn này. Tuy nhiên, điều này không phải hoàn toàn là tiêu cực, vì đôi khi tác giả cũng để cho những quãng nghỉ hợp lý, và mạch truyện dễ theo nên với một cuộc phiêu lưu kịch tính thì nhanh cũng là điều chấp nhận được. Một cuốn sách thú vị và NHANH. This was my second book by Sidney Sheldon. The plot is about a murder mystery and it is described in a fascinating manner. Well, I should not ruin the Reader's interest by describing the story here itself, right? It's a suspense story which will not allow you to put the book down. Now, it's obvious that whenever you read anything , you get to learn something. From this book, I literally loved the character of Dana Evans(the leading character). Despite having many troubles, She The Sky is Falling! Now, it's obvious that whenever you read anything , you get to learn something. From this book, I literally loved the character of Dana Evans(the leading character). Despite having many troubles, She never gave up on what she truly believed and ultimately she got success in her task. Apart from this, She had the courage to take risks in order to prove herself. So, this is what I learnt from this book. If you are planning to read this book, then surely you can go for it, once you will finish it you will realize how amazing the book is! This book really shook me hard. The impact was just too much. I was so afraid of everything and everyone after reading this book (so read it at your own risk). Trust issues, but is it really the ones who Dana is afraid of that is really after her?